While we all hope to never need to do more than routine maintenance to our bikes, the likelihood of needing to repair our bikes increases as time goes on, especially in the world of trackdays and racing. Unfortunately for my fairly recently acquired new-to-me race bike this happened sooner than I would have hoped. A combination of errors piled on top of unfamiliarity with my bike resulted in the bike and I sliding down the track hand-in-hand. Thankfully there was no flipping or tumbling so damage was about as minimal as you could hope at the speeds we were going. Initial assessments confirmed that the bike wasn’t TOO bad off. Woodcraft rearsets, track fairings and the clip-ons saved the bike from major damage. The clutch cover took a bit of a hit since I hadn’t yet replaced the ignition cover with the one I planned to purchase from Woodcraft. Of course I also now needed to replace that cover! So began the saga of repair. Of course, being a slightly less popular bike, parts can be a little harder to track down. The first step, however, was to pull off the fairings and assess if the initial assumptions were correct. 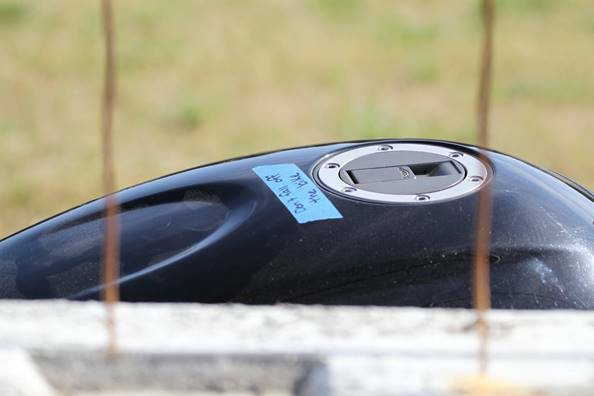 Thankfully, no hidden damages were discovered, and the fairings were sent off to a friend who has the know-how and experience to repair them. Once those were sent off, I compiled a list of what parts I needed to replace. 2 engine case covers (thankfully no leaks from either), right clip on, throttle tube, grip, master cylinder (no major damage, but enough that I’d prefer to replace it), footpeg and brake lever for the rearsets and a windshield that I believe my body took out on its launch sequence. Different people prefer to find parts different ways – going all new, OEM, or being a little flexible. I tend to fall into the “a little flexible” category. The rearset parts obviously had to be Woodcraft, and I had already planned on getting my ignition cover from them. The rest I was willing to shop around for and didn’t mind the idea of used parts. Historically I have had the best luck finding used parts on bike specific forums and occasionally from EBay, and this was no different. I was a member of Triumph675.net already, so I began searching and watching their Parts section. Hopping on EBay also revealed a few parts that may work. The shopping commenced. With my friend diligently working on my fairings, I went to Woodcraft to get the items I would for sure need from them. I found a windshield and clip-ons (an upgrade from what I had) on my forum, and a clutch cover from EBay. Another friend found me an upgraded master cylinder and a deal on the throttle tube. Let’s just say that having a network can be a pretty amazing thing! Parts started trickling in. Once most of the parts arrived I knew it was time to think about actually getting them onto the bike…I'll save the rest for my next post.